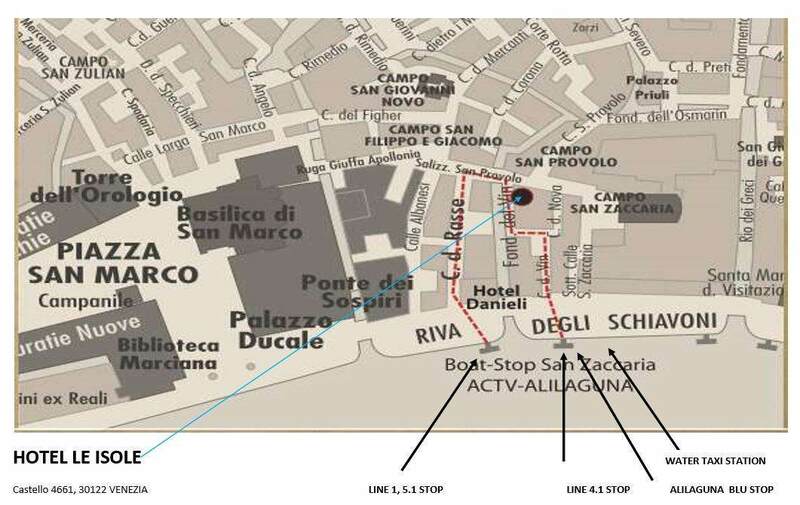 From the Santa Lucia train station: ACTV water bus (public transport) stopping at S. Zaccaria, line 1 (40 min), line 2 (32 min), line 4.1 (26 min) or line 5.1 (23 min). From San Zaccaria, take Calle del Vin near Savoia e Jolanda hotel. Walk toward Hotel Campiello. Turn left at the canal and you’ll see the door to our hotel. From the A4 highway, exit at the Venice-Mestre tollbooth. Follow the directions for Venice. Once you reach piazzale Roma, leave your car in one of the garages or the Tronchetto garage. From piazzale Roma, take one of the ACTV water bus under ‘By Train’ and continue as indicated to get to our hotel. From Tronchetto, take water bus line 2 and get off at San Zaccaria (28 min). Then follow the directions provided above. From the “Marco Polo” International Airport in Venice: Alilaguna water shuttle to San Zaccaria, Blue line (75 min). From San Zaccaria, take Calle del Vin and follow the directions under ’By Train’ | From the “Canova” Airport in Treviso: ATVO bus to Venice – Piazzale Roma. From Piazzale Roma, follow the directions listed under ’By Car‘. Otherwise, the water taxi leaves from the Venice airport, the Santa Lucia train station and piazzale Roma.